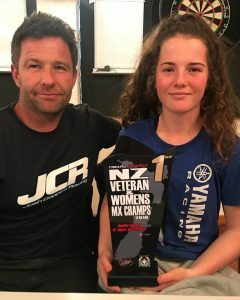 Roma Edwards is 16 years of age and already has clocked up an impressive array of wins at NZ’s Women Motocross Championship events – specifically winning 2018 Women MX Championship Junior Title 125/250cc class. 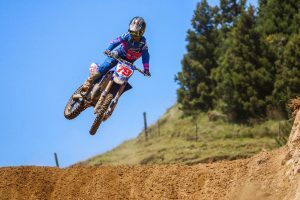 With sights set on how far the young talented rider from Motueka can take her racing, Roma made clear-cut decision to step-up level and race 2019 NZ MX Nationals 125cc class, in all out field of male riders. As #79 explains: ‘The decision to race the 125 class came about when I found out that the Women’s class which was included in 2 Rounds of Nationals last year had been dropped. I really enjoyed racing on the National tracks so thought I’d just give the 125 class a go instead for the experience. To be honest I thought there would be more girls giving it a go’. 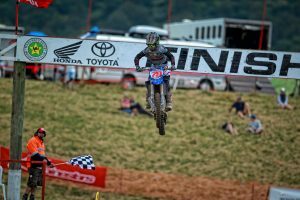 In short pre-season build-up to compete in NZ’s National MX Championship Series, Roma ticked few boxes standing top of podium with wins at Huka Honda MX Fest Women’s class, the inaugural Honda Summercross event run by Bay of Plenty MCC, and 2nd Overall Women’s class at NZ’s only annual Grand Prix: Honda Woodville GP. With big year behind the gutsy teenager, Roma takes stock on what goals were achieved and what lies ahead. #79: My biggest goal for last year was doing well at the Womens Junior Nationals as it was my last year competing in that class. I had a bad start to the year with a couple of nasty crashes and a concussion, but after a short break in the UK I got back into it and won the Michael Godfrey Womens in June 2018′. Hitting her stride, double classing at events: racing both Women’s and 125cc class, Roma pushed out the learning curve to tackle racing against the guys at National level. #79: ‘I trained really hard on and off the bike and just had a really good run. I have always double classed with the boys in the 125 class so I know my fitness is good and I am used to being amongst it. I must say though the Senior 125 class is certainly a lot tougher and way fast. I am training with the boys and they really are very supportive’. With previous Women Motocross World Champion 2x: 2006 and 2007 NZ’s Katherine Oberlin Brown (nee Prumm) and current WMX contender Courtney Duncan providing incentive to race Women’s MX, Roma pays tribute to what these Women MX Racers have achieved. #79: Growing up with such awesome role models as Katherine Prumm and of course Courtney, has encouraged me to also strive for the top‘. For 2019, Roma takes on board the experience gained from racing NZ MX Nationals 125cc then, prepares for broadening the horizon on future racing events. # 79: ‘Looking forward from racing Senior Nationals in NZ, I would like to compete in Australia at their Womens Nationals at Murray Bridge later in the year. Then just see where this takes me’. This entry was posted in Global News, Lifestyle, Moto, Motocross, Motorsports, Offroad by admin. Bookmark the permalink.